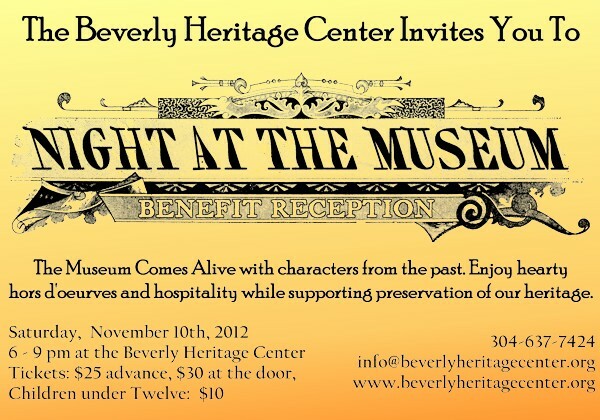 Museum characters will come to life at the Beverly Heritage Center during the annual Night at the Museum event on Saturday, November 10th. Individuals featured in each of the museum exhibits will appear in period dress and share their stories with visitors. The Night at the Museum fundraiser will be held November 10 from 6 to 9 p.m., with food, drink, and activities for attendees to enjoy. A new character appearing this year will be Aries Hill, portrayed by his descendant David Armstrong. "In researching my own family, I've learned a lot about Aries Hill and his brother, who were colorful tavern and pool hall operators in the early 20th century," said Armstrong, a local historian. "The Hill building was built by the family in 1912, and I'm excited to offer this portrayal to commemorate 100 years for the building." A small exhibit about the Hill family will accompany Armstrong's presentation. A cadre of other local characters will be portrayed this year, including a Union and a Confederate soldier who will square off against each other, rehashing the Battle of Rich Mountain. The museum's print shop will be open with demonstrations by George P. Sargent, owner and operator of the 1874 Randolph Enterprise newspaper, portrayed by Karl Mulac. Governor and Mrs. Pierpont, portrayed by Art and Pam Dodds, will discuss upcoming statehood of West Virginia. Additional characters from local history will appear to attendees as they explore the museum exhibits. Mountain Winds, a traditional woodwind trio featuring Richard Evans, Morris Kittle, and Linda Wolfersheim, will provide 19th century parlor music during the event. The repertoire includes popular period music specially arranged for the group by Evans. The social life of 19th century Beverly will be represented at the tavern bar, with Spinner O'Flaherty serving up a selection of beverages. Food at the reception will feature hearty hors d'oeuvres home-made by Beverly Heritage Center volunteers. "Each year we offer a couple of extra fun activities during this event," said Darryl DeGripp, Beverly Heritage Center manager. "This year we are holding a basket raffle, with multiple prizes from local businesses. We also have a surprise game in mind for those who enjoy a little mystery." In each of the four historic buildings that comprise the Beverly Heritage Center are four separate exhibits. The Staunton-Parkersburg Turnpike exhibit is in the Beverly Bank building, the 1808 Randolph County Courthouse portrays how the Courthouse may have looked, the Hill Building showcases life in Beverly in its heyday in the 19th century, and the Crawford Building holds the Civil War exhibit. "We invite the public to attend the Night at the Museum to explore the exhibits and gift shop and enjoy food, fun, and history!" added DeGripp. Admission to the Night at the Museum is $25 in advance, $30 at the door, and $10 for kids under 12. For more information call 304-637-7424, email to info@beverlyheritagecenter.org, or come by in person at the Beverly Heritage Center. For more updates concerning the Beverly Heritage Center and BHC events, check out our Facebook page. Other upcoming events at the Beverly Heritage Center include a block printing workshop on November 17 taught by Beverly's printer Karl Mulac. Beverly Old-Fashioned Christmas will be on December 1, where visitors can check out the shops around Historic Beverly, participate in wall basket weaving workshop at the Beverly Heritage Center, and tell Victorian Santa what you would like for Christmas!